“Drug Invasion in Budapest,” “New Designer Drug Wreaks Havoc,” “Death Toll from New Dangerous Drug Is Rising,” “Police Arrest Dealer Who Sold New Designer Drugs” – a few examples of headlines from Hungarian newspapers in the last days of summer. Hundreds of articles describing hospitalizations and lethal overdose cases in relation to the use of new psychoactive substances, especially among the most marginalized people who live in Budapest, have been published. Some articles quote angry residents who were harassed on the tram by drug users who were begging and acting aggressively. Most journalists claim the street nuisance is caused by the spread of a new synthetic drug which is being sold in certain areas of Budapest, especially near the Hős utca (Hero street) neighborhood. Responding to the media hype, the police sent regular patrols and carried out huge raids in said neighborhood and arrested more than 80 people, most of them for simple possession of illicit substances, a few of them for dealing. So there was a strong police reaction, the bad boys are behind bars. Is the problem solved? Not really. Most articles did not dig deep enough to present the real problems behind the scenes, those social factors that will reproduce drug problems and crimes. This is a typical example of a phenomenon that is described as moral panic by sociologists: arousing social concern by mass media that identifies a group of people as public enemy, to be repressed by police force, without highlighting the structural reasons for their behavior. The rising health problems and crimes reported by the media are real, but they are about much more than simply a new drug – the whole story needs to be contextualized. First of all, let’s have a look at the Hős utca neighborhood of Budapest, the epicenter of the problem! This is one of the most impoverished parts of Budapest – one of the few ethnic ghettos, populated by mostly Roma people who live in deep poverty. It consists of two blocks which were built before WW2 to house some of the poorest residents of Budapest. Most apartments are pretty small (25-31 square meters) and often more than one family lives in one room. Some of the apartments have no hot water and they have to share toilets with other households. For several decades the neighborhood was poor but not of particularly bad reputation. However, in the 2000s many inhabitants moved to other parts of the city. They were replaced by poor Roma people who came from segregated settlements of Hungarian villages, where there is no opportunity to make a decent living. They are called “immigrants” in the local slang. The ethnic composition of the neighborhood was homogenized rapidly. It became a window, a transition point between poverty-hit villages and the capital. Drug designers are in a constant hunt for new substances, imported from Asia. Uneducated and with no local social network, most of these “immigrants” could not integrate into the Budapest society. Most of their dreams of living a normal life went up in smoke. They remained as excluded from society as they were in the countryside. And then drugs have come into the picture. After 2008 Europe witnessed a huge influx of new synthetic drugs, such as cathinone-type stimulants and synthetic cannabinoid receptor agonists, partly replacing classic illegal drugs. But unlike in most part of Europe, where these new drugs were mostly used by party going young people, they became very popular among marginalized heroin and amphetamine injectors in Budapest. By 2011, heroin almost completely disappeared from the streets and most people shifted to inject cathinone, or, more and more lately, started to smoke spice (synthetic cannabinoid receptor agonist) products, dubbed “magic tobacco”. Hős utca residents recognized the financial potential in selling these drugs. One portion of magic tobacco costs 500 HUF (1.8 USD), much less than alcohol products. As synthetic cannabinoids are regularly brought under control and put on the list of new psychoactive substances by the government, drug designers are in a constant hunt for new substances, imported from Asia. Even a small mistake in this process is enough to end up with a much more potent solution which can poison consumers. Despite media reports to the contrary, there was not even a need for a new more dangerous drug to appear in the market to trigger overdose deaths and anti-social behavior by drug users. The drug market is in a constant flux, new substances have different dose-response effects and people who import them are not professional chemists. They order a white powder to be dissolved in an acidic liquid and then spray it on a plant-based material (a herb with no psychoactive properties, for example damiana). The process is as unhygienic and unprofessional as you can imagine: the police even seized a concrete mixer that was used to shake the new drug cocktail… Even a small mistake in this process is enough to end up with a much more potent solution which can poison consumers. Some of my friends who are proficient in chemistry and familiar with the Hungarian drug market say the substance from which so many people were hospitalized is 5F-MDMB-PINACA, a potent form of synthetic cannabinoid receptor agonist, currently under control in Hungary as a new psychoactive substance. They speculate that the reason why so many people overdosed on it is that some producers fucked up the solution process. Excessive use of these substances can lead to paranoid and aggressive behavior, and in some cases psychotic symptoms that need clinical treatment. It is not surprising that some of them behaved strangely on the trams. The municipality has no plan whatsoever for the social rehabilitation of the residential era, where most apartments are in municipal property. 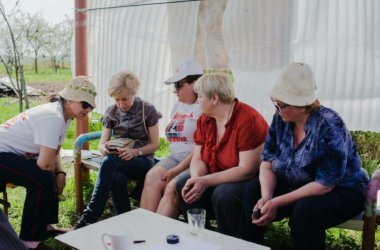 I talked to Zsuzsanna Urbanovkszy, the head of the Kontúr Association, an NGO that provides community building and social care programs in the Hős utca neighborhood. She confirmed that what we see in Hős utca is poverty-driven drug use. “These people are excluded from society so much that these groups of drug users are the only small circles where they can experience belonging and happiness,” she said. The NGO has a room in one of the blocks where they try to organize community events for local children (more than 150 children live in the Hős utca building estate!). But their work is a drop in the ocean: they don’t receive much funding and support from the local municipal council. What is worse, the council does not even communicate with them, nor with the residents themselves. The municipality has no plan whatsoever for the social rehabilitation of the residential era, where most apartments are in municipal property. What the council does is try to push tenants out and wall up empty apartments. More than 20 people are waiting for eviction now, without any alternative home. But other empty flats are in private ownership and are occupied illegally, further aggravating the debt of the residential community. And this debt is already huge: it happened that the local council did not pay for repairing pipe breakage or removing communal waste because of the indebtedness of the community. Decision makers hope that by increasing this debt they can push out unwanted renters and the problem will be solved. The Orban government significantly curtailed the autonomy and budget of district municipalities so they feel they don’t have the means and resources to tackle it. They don’t support NGOs like Kontúr and they do not send out outreach workers to work with the local community. The social and child care systems are overwhelmed, the fluctuation of professionals is huge. There are no accessible and available harm reduction programs for drug users. The current widely publicized drug problem is not so much of a drug problem – it is a problem of housing, poverty, unemployment, education, social exclusion, and structural racism. There are no accessible and available harm reduction programs for drug users – service providers are afraid that if they go to an area that has received so much public attention, they will simply be scapegoated and shut down like the needle and syringe program in the district 8 a few years ago. This is one of the saddest parts of the story: the people who try to help need to be frightened in Hungary. Without programs providing affordable social housing, education, and community jobs, without addressing racial discrimination, it would not be possible to reduce drug related harms anyway. This area should be assessed as a high risk environment and a complex, integrated strategy should be developed to coordinate the work of local actors, including the public health and social services, NGOs, the local community, and law enforcement officials. This is only a dream right now. Most of the public discourse around Hős utca is dominated by law enforcement-only strategies. That’s only enough to do city cosmetics and to relocate the problem. Thus, the police itself becomes part of the problem instead of being part of the solution. They often confiscate sterile needles and make drug users drop used needles. There is political pressure on the police to arrest as many drug users as possible to improve statistics and frame it as progress. And this is not only true for this particular urban area – but for most of the country. Hungarian society is one of the most unequal societies in the European Union. The current Hungarian government not only underfunds social and health care and education, it undermines efforts to integrate marginalized groups by pursuing a law-and-order approach.